Indian Channels rock the world in the production of TV serials and there is no match for the level of popularity that they gain around the world. 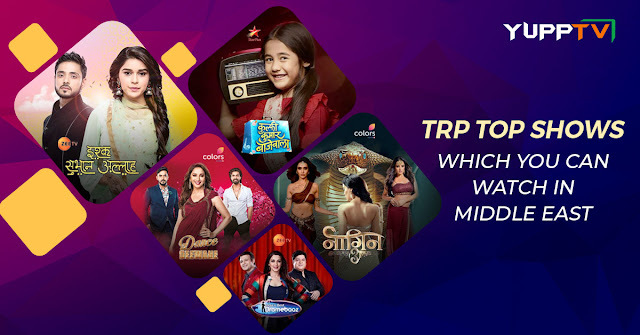 With the YuppTV services, it has become easy for the Indians and all of the Hindi TV enthusiasts living around the world to watch serials from India. But because of this availability, there is a large amount of content that has come to the screens which can make the people indecisive about the serials they want to watch. So, we have decided to make a list of popular serials according to their availability in select regions of the world, to let people choose the best among what they have, and this article concentrates on the Middle East region. Here is the list of popular Hindi Serials that are available for the Enthusiasts in the Middle East. Telecast on Zee TV at 10:00 PM – 10 30 PM (IST) on weekdays (Mon- Fri), Ishq Subhan Allah is one of the most popular serials after the long-running ones KumKum Bhagya and Kundali Bhagya. Created by Danish Javed and written by the same, the serial is being directed by Vikram Ghai. It casts Actor Adnan Khan and Actress Eisha Singh in the lead roles and runs along the backdrop of Islam, its teachings, and applications in real life. Commenced as recently as March 2018, the serial instantly became popular and is now one among the top 10 high TRP shows. Another top-rated show that is being broadcast on Star Plus Kulfi Kumar Bajewala is also a latest one and is still at the starting stages of a grand tale. The show is a remake of a Bengali TV serial Potol Kumar Gaanwala. The tv series casts Aakriti Sharma, Mohit Malik, Anjali Anand, etc., in the lead roles. This show comprises of an interesting plot that hooked the audience to it and made it one among the top-rated shows as soon as it is on the air. Kulfi Kumar Bajewala has commenced in March 2018 and is aired at 08:30 PM IST on Weekdays. Another popular show Dance Deewane which has instantly become popular soon after its commencement, Dance Deewane is a dance reality show that is aired on Colors TV every Weekend. The show is judged by Madhuri Dixit, Shashank Khaitan, and Tushar Kalia and is hosted by Arun Bijlani and Bharti Singh. The show was recently launched in June 2018 and is going to be aired every Saturday and Sunday at 09:00 PM IST on Colors TV. One of the top talent search reality shows that were used to air on Zee television in 2013 is back again this year. This second season of this show has begun in June 2018 and is judged by Vivek Oberoi, Huma Qureshi, and Omung Kumar. The show offers a pedestal for the children between 5 to 12 years from entire India to showcase their acting skills. This show is one of the most popular show and will air every Saturday and Sunday at 09:00 PM IST. Catch it from the beginning itself. Though familiar to many of the Indian viewers, Naagin tv series which used to air on Colors TV has completed 2 seasons so far and is back with the third season recently. The television series which has undergone a complete revamp now casts Anita Hassanandani, Surbhi Jyothi, Karishma Tanna, and Pearl V Puri in the lead roles after the retreat of Mouni Roy and Adaa Khan. This gripping supernatural fiction which comprises a revenge plot is on the top of TRP Charts and is the most watched Indian TV shows online and on cable. The show is aired at 08:00 PM, every Saturday, and Sunday on Colors TV.